Bold, sculptural chairs take their influence from the elegant, wood and leather seating located above the platform, in historic Union Station. The granite benches echo the form of the lobby chairs installed in the 1930's, and provide spacious seating with wide armrests, which adds a sense of grandeur to the experience of commuting. "In the old station each traveler is treated as a dignified being at an almost royal event. Following the architect's example, I decided for this project to use the concept of 'union' as my theme. This is a union of the old and the new stations and symbolizes a union of person and building as well." CHRISTOPER SPROAT was born in Boston and studied art at Boston University, the Boston Museum School of Fine Arts, and Skohegan School of Fine Arts. 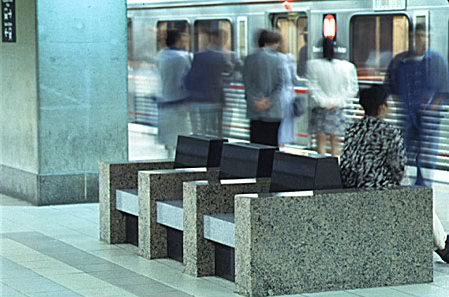 Sproat has created public sculptures for a number of transit systems and government buildings. He has received many awards and grants from entities that include the National Endowment for the Arts, Humanities Council, and the New York Foundation for the Arts. Sproat’s work has been included in exhibitions at the Whitney Museum, Museum of Fine Arts in Boston, Newport Harbor Art Museum and the Museum of Modern Art, among others.